Social Justice, in its current form, has a structural anti-Semitism problem. It’s not that the Social Justice people hate Jews. At least I don’t think they do, as far as I’m aware. It’s deeper, because it results from the structure of some of the indoctrinations within Social Justice itself. Let’s look closely at some of these indoctrinations, see how they interact, and draw up some possible ways the Social Justice tribe might fix the problem, structurally speaking. “You didn’t earn that” is an indoctrination deeply steeped within Social Justice, and it erupts in many different forms, which all tend to reinforce each other. Please note, I’m not talking about the Obama “You Didn’t Build That” argument, which simply states that independent business owners are actually quite dependent on the government. Nor am I referring to the Animal Farm style Marxists who don’t think rewards should be meritocratic at all, because these are rare outside of secret Antifa dens or the streets of Portland. I’m referring specifically to the mainline Social Justice approach, which is more layered. First, they adopt the position that people are blank slates, and all features of personality or competence are installed by society. This leads to the belief that IQ isn’t real, or at most is simply the result of a racist test. It also leads to the belief that differences in socioeconomic outcome between races must be due to environmental factors, since no other factors exist. These environmental factors are defined to be “privilege.” You didn’t earn that wage gap, you were given the wage gap because you are male, or white, or similar. So that may be true and it may not be, but its truthiness does not matter to us at this time. It is merely one piece of a larger puzzle. Put it on a shelf, we’re coming back to it later. But those who came to Jeong’s defense argued that there is no such thing as reverse racism (the idea that other races can be racist to white people). Racism, the argument goes, is an institutional and systemic belief that is only a tool of the powerful — therefore Jeong is exempt from the charges laid out. Antisemitism is [Bivol-Pavda] racist in any country where the Jews aren’t the dominant power hierarchy, but it is not racist at all in Israel. Since anti-Semites have no power there, an Israeli anti-Semite lacks a crucial variable of the (racism = prejudice + power) equation, so they aren’t racist there. An American anti-Semite would be reclassified from “racist” to “woke” by moving to Israel, because in Israel, Jews have privilege. Put that puzzle piece on the same shelf, beside the first one, as we’re going to return to it too. The roots of modern intersectionality come from Kimberle Crenshaw, and in application, work somewhat like this. Print the above grid. Circle the “identity” that describes you on each line. The more circles you have on the right-hand side of the grid, the more marginalized you are. This approach is already deeply baked into academia, and rolled out for freshman orientation at places like Cornell. According to Social Justice, the more marginalized you are, the more likely you are to have bad socioeconomic outcomes. Note that Jewish folks appear one time in the first grid, and two times in the second grid, as a marginalized group. This is our final puzzle piece. Now let’s analyze how these three pieces interact. The theory then goes like this. IQ isn’t real, or if it is, it’s just a result of a racist test. You didn’t earn that. Socioeconomic outcomes are due to privilege. Marginalized people have less privilege. People who are marginalized in multiple ways have even less privilege than people who are marginalized in one way, and theoretically have even worse socioeconomic outcomes due to the intersectionality of their marginalization. But like all theories, this theory is testable, and falsifiable, and when you start testing it on Ashkenazi Jews, you get problems. The case for Jews as a marginalized group flows primarily from two sources — the Nazi genocide of the Jews in World War Two, and modern hate crimes against the Jews, perpetrated largely by right wing extremists. There were 938 hate crimes perpetuated against Jews in 2017, which works out to be an alarming rate of 16 per 100,000, but that figure includes property crimes such as vandalism. When we go to the FBI’s hate crime database, we have no murders, eight aggravated assaults, 61 simple assaults, and 179 acts of intimidation for 2017. The rate of hate related non-fatal assault against Jews is 1.2 per 100,000, which is not too different than the white female homicide victimization rate, and well under the homicide victimization rates for all other race and gender combinations the DOJ tracks. Does this trend of largely vandalistic hate translate to worse economic outcomes? Definitively, no. Jewish people earn more money than any other religious affiliation, including whites of European descent. An astonishing 44% earn six figures, over double the national average. They also make up 25% of the 400 wealthiest Americans despite only being 2% of the total population. As someone who has adopted the indoctrinations of individualism, I don’t find these numbers difficult to explain. The Jewish folks I’ve met are usually smart, funny, successful, responsible, good looking, healthy, and good with the money they earn. But this doesn’t fit the Social Justice worldview, which equates marginalization with worse socioeconomic outcomes. The theory fails the test. When a theory fails a test, the theorist adjusts the theory, and it won’t take too much longer for Social Justice theorists to adjust this one. When they do, they’ll have three possible paths to resolve it, and I fear they’re already heading down the worst path. Move Jews from “marginalized” to “privileged” in the intersectional matrix of oppression. This allows the Social Justice tribe to keep all their other indoctrinations intact, and their theory matches the data. They can say Jews have better socioeconomic outcomes because of their “Jewish Privilege,” instead of the measurably higher IQs Jews have, or other racial traits which don’t fit the tabula rasa ideology. And it’s already happening. You can see it in the ongoing drama with the Women’s March. The binary structure of us and them is a built-in formula for intolerance. Yet in Social Justice Studies, it is this formula that lays claim to justice and is embraced without thought by many academic institutions. Students, guided by the charged language, also accept that only one side of the equation is just and progressive. They are convinced that they have come upon and chosen the right cause. So what about anti-Semitism? Unlike in the above examples of race and gender, social justice programs manage to camouflage the prejudice and hate against Jews through the tactic of splitting Jews into the binary categories of good Jews and bad Jews, with some Jews embodying the evil pole and others placed at the opposite end of the scale. Allowing some Jews to be “good” makes the social justice practitioners look like they are treating Jews fairly. But the only Jews allowed to be good Jews are those who are willing to recognize that there are bad Jews. The reality is that rather than supporting fairness, this formula works not only to solidify pre-existing anti-Semitic biases, but to enable the expression of full-blown anti-Semitism. Channa Newman’s article quoted above pulls the prior quote from Mallory apart for what it is, if perhaps unintentionally. 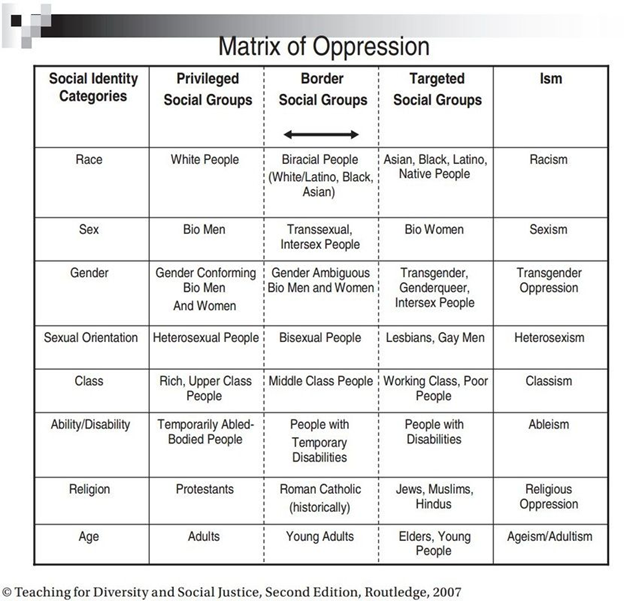 Inside the halls of academia, Social Justice practitioners are resolving the paradox by reclassifying Jews on the intersectionality matrix. This is very bad, because the Bivol-Pavda racism definition would mean anti-Semitism suddenly becomes “woke,” and Social Justice, to borrow from their own lexicon, will itself become Literally Hitler. But there are some other options they might use to avoid their anti-semitic fate, if they take a wider look. As we mentioned before on HWFO, Social Justice is a religion-like-thing with the unique and captivating feature of being crowdsourced, which means that the crowd can monkey with the indoctrinations however they like, to fix the system if it’s broken. They need to start doing this more intelligently, and with a systems analysis approach. Here are two alternate options. This would be the hardest one for Social Justice to adopt, but would be the one I would personally prefer. 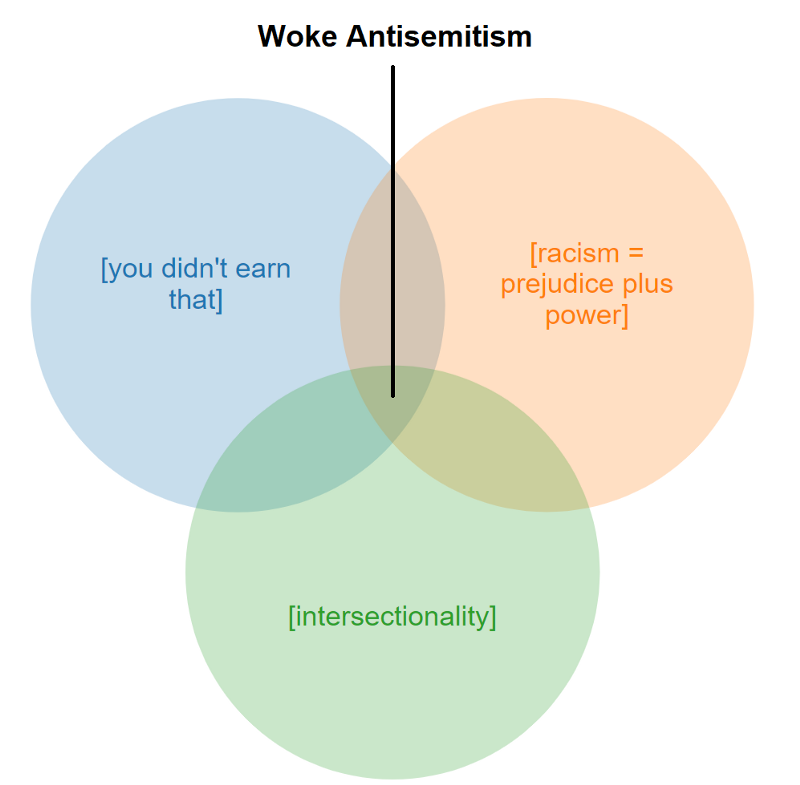 If the Social Justice crowd were to pivot away from the idea that “racism” is only something that privileged people do to non-privileged people, and instead acknowledge that racism is a universal condition that any race or group can apply to any other race or group, then anti-semitism would always stay “racist” and never gets “woke,” no matter how much privilege the Jews are assigned in the matrix of oppression. 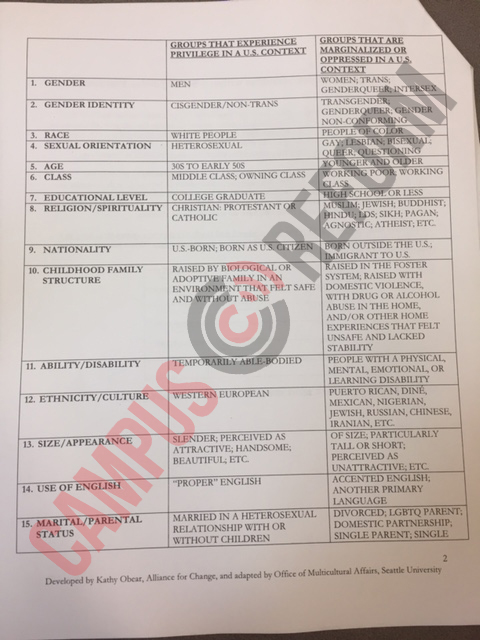 This would pivot the rules of behavior for Social Justice away from where they’re at today, and back towards “judging people not by the color of their skin, nor their intersectionality-matrix-location, but by the content of their character.” I think this would make the world a much happier place. I speculate that MLK would also agree. But I don’t anticipate they’ll do this, because they’d have to give up their own racial prejudices to do so, and giving up racial prejudices is hard. It would also deprive them of one of the weapons in their arsenal, namely their ethos that it’s okay to be racially prejudiced to white people in the name of equity. Another way for Social Justice to avoid becoming Literally Hitler would be to acknowledge the science that IQ is heritable, and that IQ is heavily responsible for socioeconomic outcomes. Further, that races have different median IQs, and Jews are at the top, followed by Asians. Or they could bail on the whole program, but I don’t consider that to be particularly likely. I’m a white male of classic sexual orientation who doesn’t think I was born in the wrong body, so I’m admittedly at the brunt of most of the vitriol from the Social Justice people right now. That said, I’m not too terribly worried because I’ll probably do alright one way or another. But if I was Jewish, I’d be very concerned that Social Justice might resolve towards “woke anti-Semitism” in the next few years. If that happens, the Jews could be getting it from both sides — both the hyper factionalized alt-right, and the widely propagated Social Justice left. What Social Justice needs now, more than anything else, is a new leadership to rise which A) understands Social Justice’s religion-like nature, B) understands systems analysis, and C) is brave enough to tinker under the hood and fix some of the broken things within it. It needs reform. Badly. The “Woke Anti-Semitism Paradox” is only one example of many. And I’m pulling for the reformers. Because if the reformers fail, or if nobody tries, this thing will probably get very ugly in the next few years.